When you combine the functionality of Gore-Tex with Alpinestars' Italian glove styling you get a premium waterproofing in a good looking glove that can take whatever nature has to offer. You get Alpinestars Patron Gore-Tex gloves. The Alpinestars Patron Gore-Tex Gloves provide waterproofing, breathability, and protection, everything you need to ride through inclement weather on your motorcycle. This full leather glove comes with PU coated reinforcement at the palm provides tactile grip and feedback of controls. while synthetic suede at the palms provide protection against abrasion. Touch screen compatible finger tips allow you to interact with your smartphone without having to take off your gloves. 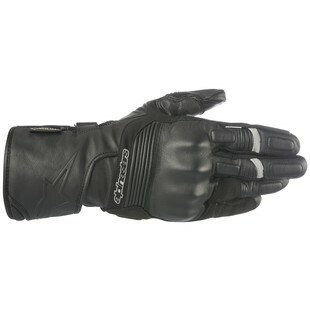 If you are the rider who wants to be prepared for everything, consider the Alpinestars Patron Gore-Tex gloves. It doesn't matter if you're throwing your leg over a sportbike, cruiser, or adventure bike. The Patron Gore-Tex gloves' styling and function will mean dry hands and protection.